Network booting is a feature, provided by nearly all widespread network interface cards. This feature allows a lot of advanced automation features to be deployed in various environments, which could decrease the amount of time that otherwise system administrators had to spend in order to complete tasks like massive server/client installations and/or re-installations, thin client solution deployments, system recovery of systems that do not have any other was of booting, like CD or USB and so on. The founding stone of network booting is the PXE (Preboot eXecution Environment) environment, which is an environment to boot computers using a network interface independently of data storage devices (like hard disks) or installed operating systems . This environment was originally introduced by Intel and uses several network protocols like Internet Protocol (IP), User Datagram Protocol (UDP), Dynamic Host Configuration Protocol (DHCP) and Trivial File Transfer Protocol (TFTP), and concepts like Globally Unique Identifier (GUID), Universally Unique Identifier (UUID) and Universal Network Device Interface (UNDI) . Step 1: PXE client sends extended DHCPDISCOVER request as a broadcast message in the network segment. Step 2: A server that run DHCP service receives the extended DHCPDISCOVER request and reply to this request with an extended DHCPOFFER. The reply is sent to the IP address, which was originating the initial discover request, via unicast communication to port 68/UDP. (There’s also a way to do this via proxy DHCP service, for environments where DHCP service cannot be deployed. For more information see PXE specifications link). Step 3: After PXE client receives the extended DHCPOFFER from the DHCP server, it now can request its network configuration by sending an extended unicast DHCPREQUEST packet to the server that runs the DHCP service at 67/UDP. 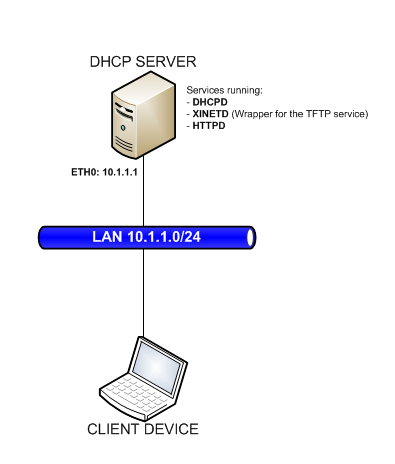 Step 4: The DHCP server accepts the DHCPREQUEST packet and acknowledges it by sending unicast DHCPACK packet to the PXE client on port 68/UDP. With this packet the DHCP request procedure is complete and the PXE client is now configured with IP address and knows the boot server information, which was propagated as part of the extended DHCPOFFER. Boot server information includes the IP address of the server that runs TFTP service and the path to the network bootstrap program (NBP) on that TFTP server. Step 5: The NBP is the program, which is executed by the PXE code after getting it from the TFTP server. This program is a boot loader, which allows us to boot the system from the network based on a configuration file. In the examples below we’ll use PXELINUX as our NBP. Step 7: The PXELINUX handles the control to the kernel that was configured and from there on the system continues to be managed by it. All of the above said was pretty much explaining the network booting process from the standard PXE point of view. The goal of this article is to explain how to use iPXE instead, which gives us a wide range of capabilities for performing the network booting rather than just limiting us to booting from TFTP server. iPXE, as described by its creators stands for ‘it doesn’t PXE’ and is a fork of the Etherboot Project, which is maintaining the gPXE. This fork is pretty much continuation of the gPXE, because the fork was done by the main developers of the gPXE and literary since the fork the contribution to gPXE project is virtually equal to zero . iPXE could be either burned to a ROM of a network interface card and then executed directly from it by the BIOS, same way as PXE is invoked, or it could be chainloaded using the already available at the network card PXE code. In below examples, we’ll show how to perform network booting from a HTTP server by using the chainloading process, because if we have to perform a network booting of huge amount of servers and we do not want to use PXE this is the most convenient way. In below couple of bullets I’ve described the lab environment that was used for building this scenario, plus I’ve included a simple diagram of the device layout and . Below are included only the configuration files, which were modified. The default configuration files are not included. if exists user-class and option user-class = "iPXE"
Below will follow a brief explanation of what the above mentioned software and its configuration are accomplishing. Step1: First thing to do is to start the server and make sure that the dhcpd daemon is running and the configuration provided above is in use. [root@server ~]# ps faux | grep dhcpd | grep -v "pts"
[[email protected] ~]# ps faux | grep dhcpd | grep -v "pts"
[root@server ~]# ps ax | grep dhcpd | grep -v "pts"
This will ensure us that the daemon has been started with the right configuration. Step 2: As a second step we have to check whether the XINETD daemon is running and the above mentioned configuration is in place. [root@server ~]# ps ax | grep xinetd | grep -v "pts"
Step 3: As a third step we have to check whether HTTPD is running. In this example we could use the default configuration of the HTTPD daemon. Step 4: We have to check whether undionly.kpxe, boot.php and client.ks are in /var/www/html/ folder. Step 5: Once we performed all of the above checks we could start the client machine and choose F12 for network booting. This will invoke the PXE environment from the client's NIC firmware, which will go through the above described PXE process. The difference from above is that once the NIC's PXE client sends the DHCPREQUEST packet to the DHCP server it'll be pointed from the later to the undionly.kpxe first (on the TFTP server). This is the chainloading mechanism, which allows us to use iPXE, even though it is not burned in the NIC ROM. The chainloading process is based on the following: The DHCP server checks the user class option from the client's packet and determines, whether the request is coming from iPXE client or standard PXE client. If request is comping from the PXE one DHCP server points it to the iPXE executable on the TFTP server, which is then loaded by the client. If the request is coming from iPXE client - it receives the URL of the iPXE script, which is parsed then by the iPXE. Once we reach this point PXELINUX is loaded and it displays the menu based on its configuration file. Above is the example file. Once the timeout defined in the example file expires, or a selection is made, the specified CentOS kernel is going to be loaded from the HTTP server. From here on the kernel takes control.